Context: Nursing process is the systematic method of thinking used by nurses to develop an individualized plan of care for patients. Effective use of the nursing process depends on a nurse's familiarity with the standardized nursing language. Aim: This study evaluates the utilization of nursing process on the day of admission and within 24 h of patient admission in a teaching hospital. Setting and Design: Descriptive and Retrospective design was utilized. Materials and Methods: Systematic sampling technique was adopted to evaluate 959 patients' records from 2014 to 2016 in 2 medical and 2 surgical wards over 3 months period using a self designed checklist. Statistical Analysis Used: Data collected was analyzed using SPSS version 21 and presented as frequencies and percentages. T test was used to test the significant difference between variables with P value set at ≤ 0.05. Results: Only 24.9% of the medical records contained the nursing process form. On the day of admission, <25% of the charts included a complete record of nursing assessment, nursing diagnoses, nursing intervention, and the evaluation. The highest phase of nursing process recorded is nursing diagnosis followed by patient assessment. At 24h postadmission, no significant increase was noted in the phases of nursing process recorded. There was a significant difference between the frequencies of documentation of nursing diagnosis and the nurses' area of practice (P = 0.001). Conclusions: Nursing process utilization remained poorly incorporated into the activities of nurses in this institution. Therefore, continuing professional education on nursing process and supervision should be mandated. The nursing process is the framework for nursing practice that reflects the activities of nurses in the patient care delivery., The utilization of the nursing process validates the extent of the role of nurses as crucial to patient care. Gone are the days that people view just the medical care as pivotal to patient recovery, nursing care is now inclusive because of the increase in accountability of the nurse as a care provider. Globally, the nursing process has been adopted in various patient care settings. In 2013, the Nursing Department of the teaching hospital in Ogun State began using Nursing process according to the taxonomy of North American Nursing Diagnosis Association-International (NANDA-1). The concept of the nursing process was initially implemented in the medical/surgical ward and was gradually used in other care areas. Since that time continuing education department has developed several courses to educate nurses regarding the nursing process. Thus, after 4 years of implementing the nursing process using the NANDA-1 taxonomy, the nursing department felt the need to evaluate the existing process. Hence, the purpose of the study is to evaluate the use of nursing process in the care of patients in this hospital in Ogun State. Specifically, the study identified the frequencies at which patient assessment, nursing diagnosis, intervention, and evaluation was recorded. There are numerous benefits of the nursing process. It improves the quality of care that the client receives, ensures a high level of client participation together with continuous evaluation designed to meet the client's unique needs and enables nurses to use time and resources efficiently. Yet hospitals are confronted with the challenges regarding the nursing involvement, including scarcity of nursing resources; difficulty engaging nurses at all levels from bedside to management; growing demands to participate in more, often duplicative, and quality improvement activities.,, However, a systemic review of research findings on the utilization of nursing process is limited, especially in Nigeria. The challenges for many institutions is to help nursing staff refine their understanding of the nursing process, to accurately identify patient problems and develop appropriate care plans,,, without majorly evaluating the implementation process and levels of integration into daily practice. In spite of the numerous benefits of using nursing process in the patient care delivery by nurses as suggested by literature; the poor utilization is quite appalling.,,, This is capable of drawing nursing backward as a profession which is contending to become recognized among another health profession., In spite of global efforts made into sensitization update and inclusion in training curricula of nursing for all nurses to meet up with necessary reforms, a good number of nurses in Nigeria, are still unaware of the existence of the dynamic nursing process including the five steps or unable to utilize it in their clinical practice. Therefore, this study evaluates the nursing process utilization in a teaching hospital in Nigeria. The study was a descriptive retrospective study where quantitative data were collected using 38% of the 2513 admission records of patients admitted in male and female medical and surgical wards from 2014 to 2016. The study was carried out at a private teaching hospital in Ogun State, Nigeria between January and March 2017. The hospital started as a medical center in the late 1970s and was later upgraded to a teaching hospital in 2012. The hospital has about 150 nurses working in different specialties. Patients' name and registration number were obtained from the ward admission list, and the records were separated into four different medical/surgical care areas: male medical, female medical, male surgical, and female surgical wards. The four wards were considered for this study because they had the highest number of patients admitted at that time and more nursing staff were working there. Moreover, these wards were first trained to utilize the nursing process. A systematic sampling technique was used whereby every 10th record was picked from a random starting point. At the end of the selection, the medical record personnel arranged the selected medical records according to the wards. Nine hundred and fifty-nine nursing records were selected and reviewed for data. A checklist was employed to evaluate the patients' records. The checklist design was guided by the phases of the nursing process. The checklist assessed for the presence of nursing process form and verifies whether the nursing records contained the phases of the nursing process at two points: day of admission and 24 h after admission. The checklist was rated as “1” for “Yes, No, and Incomplete.” Face and content validity of the checklist was confirmed by three faculty members. In addition, the reliability of the checklist was measured by internal reliability, yielding a Cronbach's alpha coefficient of 0.72. Permission to carry out the study was granted by the Ethics and Research Committee of Babcock University, approval number BUHREC173/17. A copy of the approval was taken to the patients' record department where the patients' record was collected. Consent to review patients' records was given by the personnel in charge. Information was collected in the patients' records manager office and patients charts were filed back immediately. The actual data collection process took about 3 months. Data were analyzed using SPSS version 20. Descriptive data were presented in frequencies and percentages, and the hypothesis tested using a t-test at P ≥ 0.05. The results of this study were documented starting with the demographic distribution of patients' records reviewed as shown in [Table 1]. [Table 1] shows the distribution of records reviewed per ward, per year. Little less than half of the patients' records were from female surgical ward representing 41.6% of records reviewed while 2016 had the highest patient records accounted for 42% of the medical records. It can be deduced that the patient admission was steadily on the increase since the highest patient representations were in the year 2016. For the analysis of the 959 charts, male medical ward had the highest frequency of all the phases of the nursing process recorded for the 3 years period as shown in [Table 2], [Table 3], [Table 4]. However, it was generally observed that the frequency of documentation of the nursing process steps was poor [Table 2], [Table 3], [Table 4] throughout the 3 years period. Evaluation of the presence of nursing process form showed that only 24.9% of the medical records contained the form. At the day of admission for 2014, 2015, and 2016, 17.2%, 16.4%, and 15.4% of the chart included a complete record of nursing assessment. All the wards showed significantly low percentage of the nursing assessment records. As shown in [Table 2], [Table 3], [Table 4], the nursing intervention was present in 15.8%, 19.4%, and 23.6% of the charts reviewed. In addition, nursing evaluations were present in 20.8% 16.1%, and 15.9% for the 3 years in charts reviewed. [Table 5], [Table 6], [Table 7] show a slight increase in the percentage of patients' records with nursing process form. Nursing diagnoses were present in 19.5%, 18.2%, and 19.9% for the 3 years, respectively. [Table 5], [Table 6], [Table 7] revealed no significant increase in phases of the nursing process of the charts reviewed when compared with the day of admission. Conclusively, the nursing process utilization remained poorly incorporated into the activities of nurses in this institution. 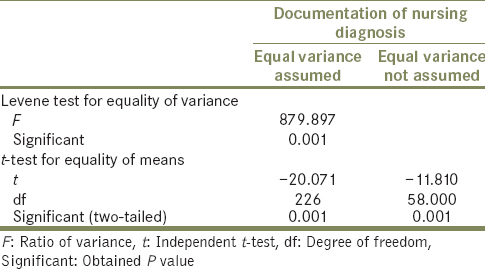 There was a significant difference found between the frequency of nursing diagnoses recorded by the nurses and their areas of practice with P = 0.001 <0.05 level of significance [Table 8]. The data showed that the hospital under study utilized the nursing process poorly. This is evidenced by the data retrieved from the evaluation of the nursing process records. The lack of inadequate entry of the nursing process may be attributed to many factors not investigated in this study. Some authors asserted that lack of enough time for the nursing process with a large number of patients can cause an impediment to the completion of the nursing process. Most nurses perceived the nursing process as a documentation of nursing activity that can only be achieved theoretically.,, Consequently, the application of the nursing process may occur as a professional obligation that may not be necessarily contributing to patient recovery. In this study, the nursing diagnostic phase was not considered an important step as evidenced by the poor recording of the process. These results are similar to studies that evaluated the utilization of the nursing process., Their findings affirmed that the recording of the nursing process, especially the nursing diagnostic statements was deficient. Moreover, nurses learned the process of the nursing process in the course of their training. This learning process does not necessarily equip them to operationalize the process. Without applying strong cognitive abilities, nurses may not be able to apply the skills. This statement was consistent with those asserted by Kramer et al., that theoretical understanding of the nursing process is not enough, clinicians should apply their cognitive abilities to interpret and appreciate its application to their practice. Nursing assessment in this study is the use of Gordon typology of 11 functional health patterns for data collection. This data collection tool is widely used by nurses to guide patient assessment. According to Gordon, the nurses who understand the assessment is capable of identifying the patient strengths and nursing diagnoses that help the nurse to develop the nursing care plan. However, in this study, nursing assessment phase was poorly recorded. This could be associated with work overload, nurse–patient ratio, and nurses' involvement with other responsibilities such as scheduling and management tasks.,,,, Some authors reiterated that lack of time with direct patient care may be linked to specific problems in the hospitals such as poor documentation and lack of research activities., Thus, low rate of nursing assessment in this study may have been a barrier to the identification and recording of nursing diagnoses. Many nurses expressed difficulty with patients' physical assessment and history taking. This could be attributed to the confusion among nurses whereby clinical examination is perceived as physicians' roles and responsibilities. Inadequate nursing assessment and physical assessment will affect the validity of the data collected for formulating the nursing diagnosis. The present study demonstrated that the nurses' documentation of nursing diagnoses was at a low level. Kollie et al. investigated the factors influencing the utilization of nursing process and concluded that institutional factor such as nonavailability of nursing process forms in the hospital prevented the nurses from utilizing the process. They concluded that the institution should consider electronic health information record whereby all the diagnostic labels are made available on a click of a button on the computer. On the other hand, Cho, Staggers, and Part (2010) reiterated that utilization of nursing process goes beyond a click of a button on a system, but nurses' responses to selecting the correct nursing diagnosis on the basis of assessment involve diagnostic expertise. In the present study, there was no significant difference in the amount of information recorded in each phase of the nursing process during admission and 24 h postadmission. This could be that the nurses do not have sufficient time to record their activities. However, if a computerized system was introduced, the time spent on the assessment and recording of the nursing process phases will reduce. This study also revealed the failure in the linkages of the nursing process steps. FMW had more nursing interventions recorded than nursing diagnoses. Therefore, the nursing diagnoses did not guide the nursing interventions in some cases. If the steps of the nursing process were not followed systematically, the plan of care may be compromised. Through assessment, the nurse can make clinical judgments to identify the patient's response to health problems in the form of nursing diagnoses. Planning includes selecting interventions for each of the patient's nursing diagnoses. After performing the interventions, the patients' response to intervention is evaluated. Similarly, Chaboyer et al., posit that practicing the steps of the nursing process allows one to be organized and to conduct the practice systematically. If the nursing process is to form the foundation for clinical reasoning and underpins all care models, it is important that all the steps of the nursing process be intentionally utilized in the care delivery process. Failure to use the nursing process organized framework will lead to the provision of care based on assumptions rather than evidence. Error in assessment will lead to serious adverse outcomes. Any care process not evaluated will eventually impact patient safety. Hence, nurses' practice and documentation should be guided by the nursing process. Limitation of the study includes using just one hospital and not all the practice areas which makes it difficult to generalize results of the study. The present analysis showed that nursing process phases were poorly recorded. Even though the nursing process has become a way of thinking for nurses in the clinical setting, the nurses working in the four areas of this private tertiary institution are yet to adequately utilize the approach as a tool for patient care. Many of the nurses have difficulties in completing the nursing care plan. This study revealed failures in the recording of the steps in the nursing process. The findings from the present study have implications for nursing practice and nursing education because the hospital is a tertiary hospital where the training of nursing students takes place. The nursing process is a scientific process utilized by nurses and nursing profession to foster a uniform approach to patient care delivery. Thus, nurses must integrate the nursing process utilization into their daily practice. Even though it may be difficult for nurses to develop and record the phases of the nursing process as revealed in this study, extra efforts should be made by nurses to overcome the challenges. As a suggestion for further research, nurses' leaders should continue to provide in-service training that would keep the nurses abreast of the importance of utilizing the nursing process. In addition, further research should be conducted to identify factors that could promote or inhibit the utilization of nursing process among this population. Moreover, results from this study were used to develop protocols of care for each unit about the recording of the nursing process and to empower the nursing staff to implement the nursing process effectively. The authors gratefully acknowledge the medical record officers for their assistance in the retrieval of the patients' records. Potter PA, Perry AG, Stockert PA, Hall AM. Fundamentals of Nursing. St. Louis, MO: Elsevier Mosby; 2013. Alfraro-LeFevre R. Applying Nursing Process: A Tool for Critical Thinking. Philadelphia, PA: Lippincott Williams and Wilkins; 2006. Paans W, Sermeus W, Nieweg RM, van der Schans CP. Prevalence of accurate nursing documentation in patient records. J Adv Nurs 2010;66:2481-9. Ofi B, Sowunmi O. Nursing documentation: Experience of the use of the nursing process model in selected hospitals in Ibadan, Oyo State, Nigeria. Int J Nurs Pract 2012;18:354-62. Abere N, Abera H, Ayana M. The implementation of nursing process and associated factors among nurses. J Nurs Care 2014;3:149-56. Kollie E, Ojewole F, Nwozichi C. Factors influencing the utilisation of nursing process. J Gen Med Pharma 2014;3:57-63. Alves AR, Lopes CH, Jorge MS. The meaning of the nursing process for nurses of intensive therapy units: An interactionist approach. Rev Esc Enferm USP 2008;42:649-55. Atashzadeh SF, Ashktorab T. Factors influencing implementation of nursing process by nurses: A qualitative study. Knowl Health 2011;6:16-23. Afolayan J, Donald B, Baldwin D, Onosaga O, Babafemi A. Evaluation of the utilisation of nursing process and patient outcome. Adv Appl Sci Res 2013;4:34-43. Reppetto MA, de Souza MF. Evaluation of nursing care systematization through the phases of nursing process performance and registration in a teaching hospital. Rev Bras Enferm 2005;58:325-9. Thoroddsen A, Ehnfors M. Putting policy into practice: Pre- and posttests of implementing standardized languages for nursing documentation. J Clin Nurs 2007;16:1826-38. Häyrinen K, Lammintakanen J, Saranto K. Evaluation of electronic nursing documentation – Nursing process model and standardized terminologies as keys to visible and transparent nursing. Int J Med Inform 2010;79:554-64. Pérez Rivas FJ, Santamaría García JM, Minguet Arenas C, Beamud Lagos M, García López M. Implementation and evaluation of the nursing process in primary health care. Int J Nurs Knowl 2012;23:18-28. Kramer M, Holaday B, Hoeffer B. The teaching of nursing research – Part II: A literature review of teaching strategies. Nurse Educ 1981;6:30-7. Gordon M. Nursing Diagnostic Process and Application. St. Louis: Mosby; 1994. Hagos F, Alemseged F, Balcha F, Berhe S, Aregay A. Application of nursing process and its affecting factors among nurses working in Mekelle zone hospitals, Northern Ethiopia. Nurs Res Pract 2014;2014:675212.
de Moraes Lopes MH, Higa R, Dos Reis MJ, de Oliveira NR, Christóforo FF. Evaluation of the nursing process used at a Brazilian teaching hospital. Int J Nurs Terminol Classif 2010;21:116-23. Paganin A, Moraes MA, Pokorski S, Rabelo ER. Factors that inhibit the use of nursing language. Int J Nurs Terminol Classif 2008;19:150-7. Müller-Staub M. Evaluation of the implementation of nursing diagnoses, interventions, and outcomes. Int J Nurs Terminol Classif 2009;20:9-15. Cho I, Staggers N, Park I. Nurses' responses to differing amounts and information content in a diagnostic computer-based decision support application. Comput Inform Nurs 2010;28:95-102. Chaboyer W, McMurray A, Wallis M. Bedside nursing handover: A case study. Int J Nurs Pract 2010;16:27-34.